Watching the Olympics this year was incredible. Michael Phelps, Gabby Douglas, gold medals abounding, new world records set left and right – it was amazing. Through all of it, I couldn’t help but think of the glory of God reflected in humanity…and, of course, Star Trek. 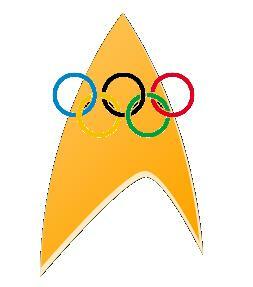 We, like Roddenberry, are drawn to human excellence in any form. We watch the Olympic games to see athletes push themselves to the limits of human capacities. As they stretch themselves to seeming superhuman levels of strength, speed and endurance, we nonetheless intrinsically recognize that they are, while totally exceptional, like us. Watching the Olympic games gives us hope that the human potential to achieve amazing things is not just limited to people who get to be on TV, but that it is in all of us. In those moments of powerful, compelling achievement, the flags on the uniforms disappear and we see, not a foreign country vying for a prize, but a human person like us reaching inside themselves to pull out the best of their capabilities. We are moved, not by patriotism or a competitive spirit, but by another human being who, for at least a moment, we can relate to in ways that we might not normally find within ourselves. It was not the first or the last time that Douglas made an effort to specifically seek to praise God through her accomplishments. I was impressed by her focus on what her abilities were given to her for and what her hard work ultimately accomplishes: the glory of God. But, even athletes who don’t have such a focus also reflect God’s glory, even when they don’t intend to, because they are examples of the greatness of God’s creation. All of God’s works reflect his greatness, as is perhaps unwittingly alluded to in this Nike ad that ran during the Olympics. Indeed, greatness is in all of us, not because of ourselves, but because we are made in the image and likeness of a great God. Gene Roddenberry saw that human beings were capable of extraordinary things and chose to believe that we were all part of God, that we were somehow intrinsically divine. The truth however, is that we are instruments of God, chosen and designed by him to participate in the great story of his goodness, grace and mercy. Mere humans reflecting the God of the universe? No wonder Roddenberry saw divinity in humankind. What greatness is in you? What has God called you to do that may seem a small thing to someone else, but to you may seem like building a warp engine? Maybe it’s going for the gold. Maybe it’s jogging down the street. I encourage you to embrace the image of humanity that Star Trek shows us – human beings who, as Roddenberry says, are clever and work hard. Perhaps we’ll be more willing to engage that part of ourselves if we realize that it’s not about our cleverness and hard work, but about the way those things reflect our Creator. May we Live Long and Prosper through Christ in the pursuit. Get your copy of Light Shining in a Dark Place: Discovering Theology Through Film here.